Big Brothers Big Sisters of Shelby & Darke County’s Executive Director Jennifer Bruns accepts a check from Lauren Henry, Wilson HealthCare Foundation’s director. GREENVILLE – Wayne HealthCare Foundation recently partnered with Big Brothers Big Sisters of Shelby & Darke County to assist with the purchase of healthy snacks for its after school Big Buddies programs. Big Buddies is a nine-month commitment in which high school students volunteer two times per month to mentor elementary students. During these meetings, high school students, under the supervision of Big Brothers Big Sisters staff, work with one or two children on educational and recreational activities. This year’s curriculum is titled “Mindfulness: Healthy Minds, Healthy Bodies” and focuses on brain development, social and emotional growth, nutrition and exercise. In Darke County, Big Brothers Big Sisters hosts Big Buddies programs at Ansonia, Greenville and Versailles schools. High school mentoring programs have become a widespread component of many nationally affiliated Big Brothers Big Sisters agencies. Studies prove that children who spend time with a positive role model are more likely to become healthy, productive adults. Big Brothers Big Sisters has a vision for all children to achieve success in life. Its mission is to provide children facing adversity with strong and enduring, professionally-supported one-to-one relationships that change their lives for the better, forever. By partnering with parents, guardians, volunteers and others in the community, BBBS is held accountable for each child in its program achieving higher aspirations, greater confidence, better relationships, avoidance of risky behaviors and educational success. The Big Buddies program has proven beneficial not only for the “Littles” but for high school volunteers as well. 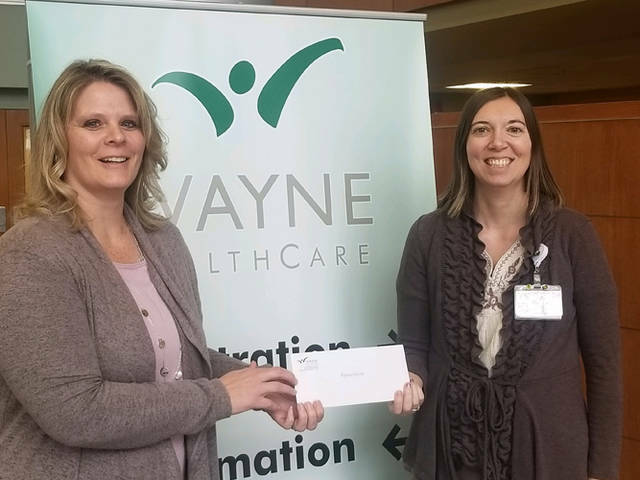 Wayne HealthCare Foundation is a 501c3 non-profit organization that began in 2007 in order to perpetuate and advance the highest quality of health care services in Darke County. Its mission is to provide quality care and promote wellness close to home. It is a mission, that at the heart, strives to strengthen community health. Providing funding for healthy and nutritious snacks for Big Buddies is one step toward achieving this mission. Big Brothers Big Sisters is a non-profit United Way partner agency with more than 25 children waiting to be matched with a caring adult. Anyone who would like to become an event sponsor, donor, volunteer or learn more about how you can make a difference in a child’s life, may contact the local agency at 937-547-9622 or go to www.bigbrobigsis-shelbydarke.org for more information.